Work anywhere with this convenient rolling Podium / laptop cart. 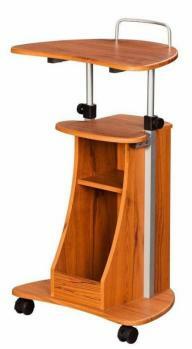 You can easily adjust the height of this adjustable Podium/laptop cart to suit your needs. 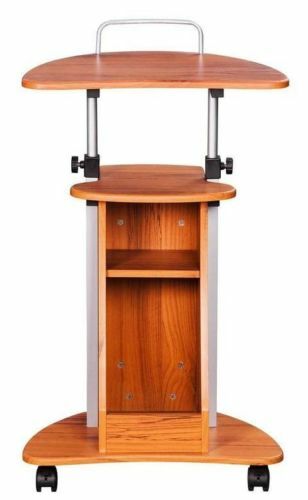 With its storage compartment and easy-roll double-wheel casters, this podium/cart is ideal for apartments, dorms and the office. The desk area of this podium/cart can be adjusted from 28'' to 44'' in height. The shelves under the desk have plenty of space and can be used to store accessories or books. The three double-wheel casters on the cart provide easy mobility and give you the freedom to comfortably use it in whichever room you want. Under desk double storage compartment.